Old fashioned recipes from Great Grandma's day are the specialty of this one-of-a-kind dessert site. If you love to try old fashioned desserts, there are hundreds featured on these pages organized according to type. Maybe you've read about these historic recipes in books or magazine articles, or maybe you've heard them spoken of on the History Channel. Well, here's your chance to try them. This unique spice cake isn't hard to make, and it tastes and looks absolutely delicious. Like a hope chest, it's filled with all the best ingredients. And it's perfect for serving at your next bridal shower, anniversary, or any party. It will be a real conversation starter. Cream the shortening, add sugar and cream in well, then work in the eggs. Sift dry ingredients and add alternately with the milk (save a little flour for dredging the fruit mixture). Then add the vanilla extract, and orange juice. After removing all of the white skin, grind the orange rind, nuts, and fruit, and add the mixture, floured, to the batter. Turn into loaf pan that has been lined with wax paper. Bake in moderate oven (350°F) for 1-1/2 hours. Decorate with hinges and a lock made of banana icing, or an icing of choice; or, cover completely with icing, and add hinges, and a lock of a contrasting color. In Grandma's day, it was a common tradition that a young unmarried woman anticipating her eventual married life would begin to store special clothing and household linens in a "hope chest" or "wedding chest." 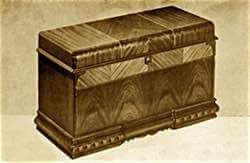 Unmarried girls in Great Britain and some Commonwealth countries often called them "glory boxes." Here's an old fashioned recipe for cookies from my Great-Grandma's notebook that you'll enjoy trying. These Rural Cookies are so very easy to make and taste delicious. Break an egg in a teacup, put in three tablespoonfuls of melted butter, one of sour cream, a little bit of baking soda, then fill up with sugar; mix soft; shape; bake in a quick oven. This old fashioned recipe is a family favorite. Mom often used it to make delicious dessert biscuits to take to family get-togethers or to serve on special occasions. Though the biscuits recipe calls for a filling of chopped raisins and citron, Mom often substituted small whole raisins, and-or sometimes chopped nuts. Two cups of flour, quarter teaspoonful salt, four teaspoonfuls baking powder, two teaspoonfuls butter, three-quarters cup milk, roll batter one-fourth inch thick, spread with two tablespoonfuls melted butter after rolling, then spread on a mixture of two tablespoonfuls sugar, one-half teaspoonful cinnamon, one-third cup chopped raisins and citron, roll like jelly roll, cut off in slices, spread with softened butter and bake. Pin wheel biscuits are delicious. Here's an easy tea biscuit recipe. Tea biscuits are delicious when eaten warm from the oven with butter or with your favorite jelly preserve generously spread upon them. Make some today! Sift one quart flour, with three teaspoons baking powder, and a pinch of salt. Add enough milk to make dough as soft as can be rolled, roll out an inch thick, spread with melted butter and sprinkle lightly with granulated sugar, roll like jelly roll, cut in slices about an inch thick, and bake till done. Having a big family gathering? Here's one for you! 6-1/2 quarts of flour, 1/2 cup salt, 3/4 cup baking powder, 3 cups lard, 2 quarts milk. Mix flour, salt, and baking powder, and sift twice. Cut or rub in the lard. Add milk slowly to make a soft dough. Roll dough out on slightly floured board to 3/4-inch thickness and cut with a sharp biscuit cutter. Place on greased baking sheets and bake in a quick oven (425°F) 10 to 15 minutes. This recipe will make about 100 biscuits. Egg custard is a favorite comfort food that's old as the hills. Several readers have requested an authentic custard recipe so here's a good one from Grandma's day. The old fashioned recipe clipping is dated 1900! Enjoy the rich, flavorful taste of this old time baked custard. Whites of four eggs, one cupful of granulated sugar, one teaspoonful of vanilla, one and one-half pints rich milk. Stir the eggs, sugar and vanilla together. Add the milk, heated, but not boiled, and strain. Pour into custard cups; stand in a pan of hot water and bake in a moderate oven until firm in the center. Test by running a knife into the custard; if it comes out clear, it is done. One egg, one tablespoon melted butter, salt, one-half cup milk, one-half cup flour, one tablespoon sugar, three to four apples. Beat egg yolk, add butter, salt, and one-half the milk. Stir in the flour and sugar to make a smooth batter. Add remainder of milk and fold in stiffly beaten egg white. Wash and core apples, but do not pare. Slice one-half inch thick, dip in batter and fry in deep fat, 385°F. Drain on soft paper and sprinkle with granulated sugar. Here's another comfort food recipe from the past that you'll enjoy trying. These old fashioned country-style buttermilk candies are very easy to make and taste truly yummy! This old fashioned recipe is from a farm magazine clipping, so you know it'll be good. You couldn't fool those farm wives. Boil together 2 cups sugar, 1 cup buttermilk, and butter size of a walnut until it forms a soft ball in water. Remove from the fire and beat until smooth and creamy. Pour into buttered pans and cut into squares when cool. The following dessert article gives visions of comfort on retiring for the night. The old fashioned recipes featuring organic, home-grown honey were prepared in the 1920s by the food specialists at Macdonald Institute, O.A.C., Guelph, for the farm folks of Ontario. Spread slices of toast with butter. Drizzle with honey and sprinkle with cinnamon. About three-quarters of a tablespoon of honey is needed for each slice. 1/2 cup sugar, 1/3 cup honey, 1/2 teaspoon baking powder, 1 egg, 1/2 cup sour cream, 2 teaspoons ginger, 1/8 cup butter, 1/2 teaspoon baking soda. Flour to roll out, about 4 cups. Cream the butter, add sugar, honey, and well-beaten eggs. Sift flour, soda, baking powder, and ginger. Add alternately to egg mixture with sour cream. Roll dough to one-quarter inch thickness, cut, and bake on greased cookie tins in a moderate oven. 1 egg, 2 cups milk, 2 tablespoons honey. Beat the eggs until very light. Add honey and milk and mix well. Chill before serving. 2 teaspoons cocoa, 2 tablespoons honey, 1 cup milk, 1/8 teaspoon salt. Blend cocoa and honey. Heat milk to boiling point, remove from fire, and add honey mixture and salt. Sir well, pour on cracked ice, and garnish with whipped cream to serve. It's always fun to make something that's now mostly store-bought. Homemade marshmallows not only taste delicious, but you can make them in any flavor or color you choose. You can even cut them in fancy shapes as illustrated in the above photo. Just imagine a snowflake marshmallow floating on your hot chocolate this winter. Add nuts, raisins, cherries, or dried fruit to make your marshmallows even more chewy and delicious. With this old fashioned recipe, you'll get to experience a taste-treat from great-grandma's day. Soak the gelatine in 8 tablespoons cold water. Heat the sugar with 1/2 cup water until dissolved. Add gelatine to syrup and just bring it to a boil, take off the stove and let stand in a bowl until partially cool. Add salt and flavoring, beat with a whip until soft, then with a large spoon until only soft enough to settle into a sheet. Dust pans thickly with finely powdered sugar, pour in the candy mixture about 1/2 inch deep, and set to cool until it will not come off the finger. 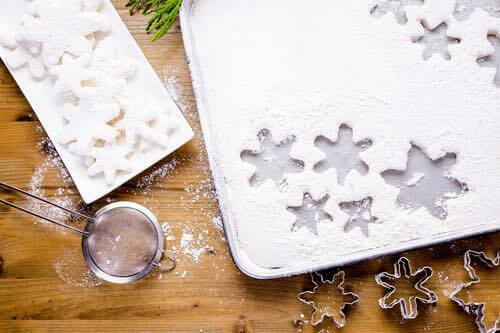 Turn out on powdered paper, cut in cubes and roll in powdered sugar. Nuts, chocolate, or candied fruit may be beaten in, or the marshmallows may be rolled in grated coconut before being powdered with sugar. Six ounces of powdered sugar, three whole eggs well beaten together as for sponge cake, add one teaspoonful of vanilla extract and three ounces of fine flour; butter the baking tines and apply the batter, with a soft brush, as large as buckwheat cakes (pancakes) and very, very thin; bake about three minutes in a good oven, when they are colored on the edges, they are done; roll quickly over a stick, the thickness of a little finger. —Kate Quattlander, New York. Boil together the following ingredients: Two cupfuls of brown sugar, two cupfuls of cooking molasses, one cupful of butter and lard mixed, one tablespoonful of ginger, one tablespoonful of cinnamon, and one teaspoonful of cloves. Remove from the fire, and allow to cool. In the meantime, sift four cupfuls of flour, and when the above mixture has cooled, stir into it about half the flour. Dissolve a teaspoonful of soda in a tablespoonful of warm water, and beat into the mixture. Stir in the remainder of the flour, making the dough stiff enough to roll into half-inch pieces, and place on well buttered tins, leaving plenty of room to spread. Bake in a moderate oven and let the cookies cool before taking them from the tins. —Mary E. Underwood, Illinois. Some old time dessert recipes don't easily fit into the dessert categories on my website, so I've added them to this page for your enjoyment. They give you a little "taste" of what's available on this unique food website. Some are rare, hard-to-find dishes only known regionally and unheard-of elsewhere. Others became lost and forgotten in the many decades since the original cookbooks were published. Unfortunately, most modern cookbook authors and publishers concentrate on the newer desserts at the expense of old favorites. Enjoy trying these old fashioned recipes from Great-Grandma's day. They're the actual recipes that she used, written word-for-word the way she read them. For their historical value, I haven't changed a thing. Some of these vintage desserts are well-known, some not so well-known, and some are downright unusual. But, all are interesting to make and delicious to eat. Aside from the old fashioned recipes on this page, you'll find hundreds of others sprinkled throughout this site. So, pour yourself a cup of your favorite beverage and enjoy exploring the following pages.